Educator, philanthropist, born at Fuentellana, Spain, 1488; died at Valencia, 8 September, 1555. Son of Aloazo Tomas Garcia and Lucia Martinez Castellanos, the saint was brought up in the practices of religion and charity. Every Friday his father was wont to give in alms all the meal he earned at the mill, besides his usual daily dole of bread. On great feast-days he added wood, wine, and money; while to poor farmers he loaned money and seed. On the death of her husband, Lucia continued the usual alms, and supplied indigent maidens in the neighbourhood with clothing and money. When sixteen tears old, Thomas entered the University of Alcala, where, after proceeding master of arts and licentiate in theology, he filled the chair (1514) of arts, logic, and philosophy. Among his auditors were the famed scholars Ferdinand de Encina and Dominic Soto. With Alcala, however, ended his university associations, he having declined the chair of natural philosophy at Salamanca, where he joined the Augustinians in 1516, his vows following a year later, and his ordination to priesthood the year after; his first Mass was celebrated at Christmas, 1518. 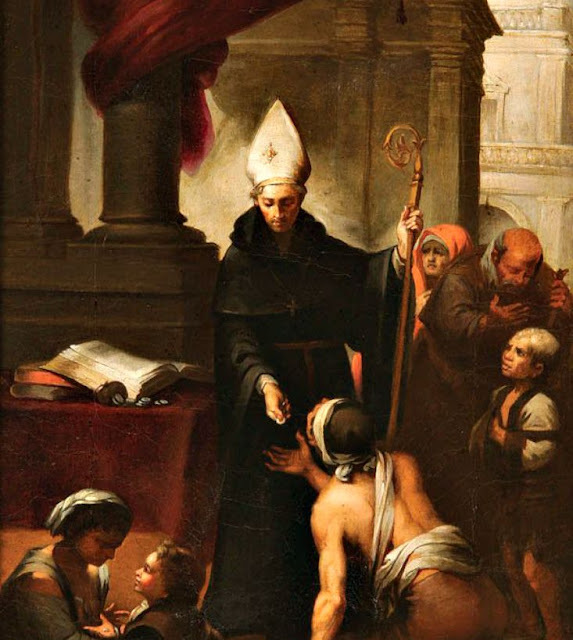 At Salamanca Convent Thomas was given the class of scholastic theology because of his attachment for books, chiefly the Lombard and St. Thomas, and his exemplary life. Preaching in the pulpits of Spain was soon added to his duties, among other places at Valencia, the field of his later trials, and Valladolid, seat of the imperial Court and residence of the Emperor Charles V when on his visits to the Low Countries. In this last-named city St. Thomas was named by the emperor his court preacher, and one of his councillors of state. Rarely, however, did the saint pay visits of ceremony to the then master of Europe, though his written correspondence with Charles, who held his opinions in high esteem, was voluminous. Towards the close of his life, while at Valencia, he had all the emperor's letters destroyed; his own letters to the emperor, however, are now stored at Simancas. Apart from these burdens Thomas held many offices of trust in his order, e.g. as convent prior in various cities, among others at Valladolid in 1544, the very year he was called to the See of Valencia. Moreover, he was twice provincial-prior, first of Andalusia and Castile in 1527, then six years later of Castile alone, whence the first mission band of his brethren was sent across the Atlantic in 1533 to establish houses of their order in Mexico. On 5 Aug., 1544, he received his nomination to the Archbishopric of Valencia, a post that for well-nigh a hundred years had witnessed no bishop in residence, an appointment that was confirmed by Paul III. Previously St. Thomas had declined the See of Granada, offered him by the emperor, while that of Valencia he accepted only through obedience to his superiors. He was consecrated in the church of his order at Valladolid by Juan, Cardinal Tavera de Pardo, Archbishop of Toledo. On his entrance to his see on 1 Jan., 1545, of which he was thirty-second bishop and eighth archbishop, St. Thomas opened his career as legislator and philanthropist, which won for him the titles of "Almsgiver", "Father of the Poor", and "Model of Bishops", given him at his beatification in 1618 by Paul V. During his eleven years of episcopal rule his most noteworthy deeds were as follows: a visitation of his diocese, opened a few weeks after entrance into his see. Among other amendments he inhibited his visitators from accepting any gifts whatever. He then held a synod, the first at Valencia for many years, whereby he sought to do away with a number of abuses, as bloodshed, divorce, concubinage, and many excessive privileges or unreasonable exemptions; he abolished the underground prisons; rebuilt the general hospital at Valencia which had just been destroyed by fire; founded two colleges, one for young ecclesiastics, the other for poor students; laboured for the conversion of the , whose profession of Christianity was largely mere outward show; established a creche near his palace for foundlings and the offspring of indigent parents; had Mass said at early hours for the working-classes; and in brief, by statutes, by preaching, and by example, strove to reform the morals of churchman and layman. Towards the poor especially his heart was ever alive with pity; to them his palace gate was always open; daily he had a repast for every poor person that applied for help, as many even as four to five hundred thus getting their meals at his hands. In every district of the city he had almoners appointed with orders especially to search out the respectable persons who shrank from asking alms; these he had supplied with money, food, clothing, while as to indigent workmen, poor farmers, and mechanics, he replenished their stock and brought them tools, thus putting them in the way of making a living. His whole life as replete with acts of practical kindness. He spent his spare time chiefly in prayer and study; his table was one of simple fare, with no luxuries. His dress was inexpensive; he mended with his own hands whatever needed repairs. Numberless are the instances of St. Thomas' supernatural gifts, of his power of healing the sick, of multiplication of food, of redressing grievances, of his ecstasies, of his conversions of sinners. He was taken ill in August, 1555, of angina pectoris, of which he died at the age of 67, at the termination of Mass in his bedroom. His last words were the versicles: "In manus tuas, Domine", etc. ; his remains were entombed at the convent Church of Our Lady of Help of his order outside the city walls, whence later they were brought to the cathedral. The saint was of well-knit frame, of medium height, with dark complexion, brilliant eyes, ruddy cheeks, and Roman nose. He was beatified by Paul V (7 Oct., 1618), who set his feast-day for 18 Sept., and canonized by Alexander VII on 1 Nov., 1658.